Balusters, Brackets & All Kinds Ornamental Work. Bixler Wm. H., alley rear E. Antietam. Thomas D. A. & Co., room 3. Hamilton Row. Shipp, John A., cor Franklin and Walnut. Sterling & Son, 6-8 E. Washington. Robinson Levi, (the oyster and ice cream man) 111 High. Ullrich John C., 110 W. Franklin. Spangler Chas. A., 39 N. Potomac. 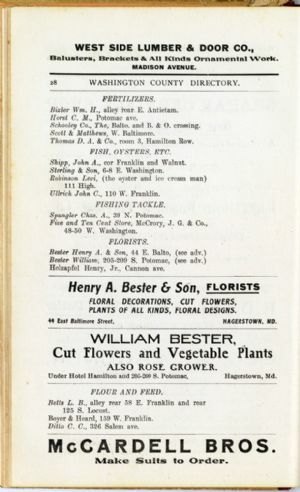 Holzapfel Henry, Jr., Cannon ave.
PLANTS OF ALL KINDS, FLORAL Designs. 44 East Baltimore Street, HAGERSTOWN, MD. Under Hotel Hamilton and 205-209 S. Potomac, Hagerstown, Md. Ditto C. C., 326 Salem ave.